At virtually the exact same starting price as the 2018 Toyota RAV4, you can get a 2018 Volkswagen Tiguan instead. The Tiguan is better to drive, has a roomier interior and can be equipped with seating for up to seven passengers. And that’s not all that sets these two vehicles apart! We did the legwork and compared these two family crossovers and determined you simply get more value from the 2018 VW Tiguan. Read on to discover just what makes the Tiguan so superior. Then, stop by our dealership location for a test drive. And be sure to check out our new car specials to see how much you can save this month on a brand-new VW Tiguan. We post new specials each month! Whether you opt for the third row of seats, which easily fold flat for storage, or stick with the two-row configuration, you’ll get more room to stretch out and enjoy the drive in the 2018 Volkswagen Tiguan. And with all seats folded flat, you’ll get 73.5 cubic feet of storage. That’s vastly more than the 2018 Toyota RAV4. An ingenious latch in the cargo area lets you fold down the second row of seats from the trunk — making expanding your total available storage area in the Tiguan totally painless. And with the available panoramic moonroof and ambient lighting — not available on the RAV4 — the interior of the Tiguan feels open, modern and comfortable. Both vehicles in our comparison are available with just a single engine option — and the engine in the Tiguan gives you vastly more power. It provides a handful of extra horsepower and almost 50 additional lb/ft of torque compared to the 2018 Toyota RAV4. That means spirited acceleration and an enjoyable, dynamic driving feel no matter how many passengers or pounds of cargo you’ve tucked inside the 2018 Volkswagen Tiguan. It also provides an 8-speed Tiptronic® automatic transmission for smooth access to all your engine power. You get a basic 6-speed transmission in the RAV4. Safety is always a priority when new-car shopping, and both these vehicles have the safety bona fides to give you confidence and peace of mind — but the Tiguan has a trick up its sleeve. Both vehicles received the Top Safety Pick award from the Insurance Institute for Highway Safety, meaning they performed admirably in all crash tests. Both the 2018 Volkswagen Tiguan and the 2018 Toyota RAV4 are available with advanced driver assistance features, including autonomous emergency braking, blind spot monitor, adaptive cruise control and more. What sets the Tiguan apart is VW Park Pilot. Park Pilot provides visual and audio cues to help guide you in and out of tight parking spaces, and can even engage the brakes for you if an unseen obstruction or passing traffic blocks your way. 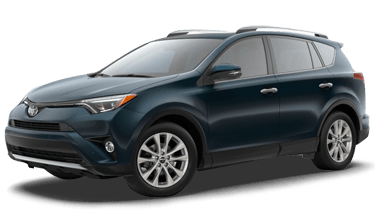 The 2018 Toyota RAV4 has no reverse emergency braking.